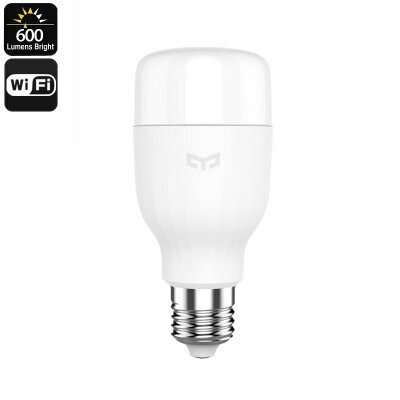 Successfully Added Xiaomi Yeelight E27 Smart LED Bulb - Plug And Play, App Control, WiFi, Energy Efficient, 8W, 600lm, 4000K Color Temp to your Shopping Cart. The Xiaomi Yeelight E27 Smart LED Bulb is the perfect smart home accessory to any modern household out there. Supporting Wifi and App control, this smart light bulb can be efficiently controlled from afar and comes along with an abundance of smart features. Its easy to operate design allows you to simply screw it into your E27 lamp socket and, once connected, it will automatically be synchronized with the Xiaomi Smart Home application after which it’s ready for use. Compatible with the majority of electronic devices, this smart LED light can be easily controlled via your tablet or smartphone no matter your operating system. Emitting a warm and pure 4000K white light, this Xiaomi light bulb is perfect to be used with desk lamps, reading lights, or any other type of atmosphere lightning. As a high-performance LED, this Xiaomi light bulb creates a comfortable lighting that is soothing to the eye – allowing you to read your favorite book after dark without hurting your eyes on the bright white light emitted by the vast majority of cheaper LED Lights out there. Emitting 600lm, you can be assured that this Smart LED provides enough light to illume its near surroundings with comforting white light – creating the perfect relaxing atmosphere. With 8W low power consumption, the Xiaomi Yeelight E27 is energy efficient – making it both environment-friendly and cheap to use. With its ultra-long service life, the Yeelight provides you with an affordable source of light for years to come. When paired with your smartphone or tablet via the Xiaomi Smart Home mobile application, this Smart LED light can be easily controlled from afar. Switching it on and off, and even controlling its brightness or setting a timer, this smart home accessory comes packed with an abundance of smart features to make your life easier. The Xiaomi Yeelight E27 Smart LED Bulb comes with a 12 months warranty, brought to you by the leader in electronic devices as well as wholesale electronic gadgets..
Arabic: - لمبة LED الذكية - Chinese Simplified: - 智能 LED 灯泡 - Czech: - Inteligentní LED žárovka - Danish: - Smart LED pære - Dutch: - Slimme LED-lamp - French: - Ampoule de LED Smart - German: - Smart LED-Birne - Hebrew: - נורת LED חכם - Hindi: - स्मार्ट एलईडी बल्ब - Italian: - Smart LED Bulb - Japanese: - スマートな LED 電球 - Korean: - 스마트 LED 전구 - Malay: - Mentol LED pintar - Norwegian Bokmål: - Smart LED-pære - Romanian: - Bec LED Smart - Russian: - Smart светодиодная лампа - Spanish: - Bombilla LED inteligente - Thai: - หลอดไฟ LED อัจฉริยะ - Turkish: - Akıllı LED ampul - Vietnamese: - Bóng đèn LED thông minh.